Three months later and the video is finally finished - so here we go! We always knew we were to be at the mercy of the weather - and despite waiting patiently to find a weather window, it was becoming increasingly obvious that it would be impossible to find flyable conditions on Mont Blanc any time soon. Irwyn, Jenni and Graham (the paraglider pilots) decided on Thursday that the weather and wind conditions were definitely not going to allow any flying above the Gouter hut at 3,800m and so Jam and I set out alongside our Mountain Guide, Marco Tamponi, to begin our climb on Friday the 13th. Not the best first omen. After having some dinner in the Gouter Hut - and attempting to get some sleep (in the same dormitory as 125 other climbers) we set off for our final day and summit attempt at 3am on Saturday morning. We spent 4 hours climbing in the dark - with only a small beam from out headlights showing the way (and the steep drops either side of the ridge!). Despite the recent dumping of around 40cm of fresh snow, we kept up a great pace - catching and overtaking many groups who had set off much earlier than us - and when we got to the Valet Hut we were amongst the leading groups. The conditions were awful, with 40kph winds creating temperatures of around minus 15 degrees, but with 2 hours to go, we were feeling pretty strong and confident of making our way to the top. We had a short break to take on some food and as we got up to leave, Jam said 'Bloody hell - I think we might actually pull this off'. The next hour of walking turned out to be one of the toughest that I've faced. As we climbed up and over the Bosses ridge to a height of around 4,500m - we were climbing in a whiteout, with 2 hours until sunrise, battling 50kph winds and a windchill that dropped to minus 27 degrees. We both lost feeling in our fingers and toes and my eyelashes froze my eyes open! With only 300m to go to the summit, Marco stopped us to say that there was no point in continuing and that the cold was reaching dangerous levels. It was one of the hardest decisions I've ever made, but we had to agree with him, and so we began our descent back down the mountain. I was crushed - a devastating decision, but the correct one. As the sun came up, we got to see the fantastic route that we had covered in the dark and but, if truth be told, my head was down the whole way. 300m from the top! We got so close. And I don't think I'll be able to get over it until I return to re-attempt in better conditions. We're both back in London now, and back in the office tomorrow. It's been an incredible adventure - and despite being absolutely devastated about the final outcome, I've had an amazing few weeks with some fantastic people - and once the dust has settled I'll post some final thoughts and thanks on here soon. I'll also be putting together a collection of photos - and hopefully a great video montage of the whole trip - so watch this space. Thanks a lot for all of your support. WE HAVE A SUMMIT DATE! 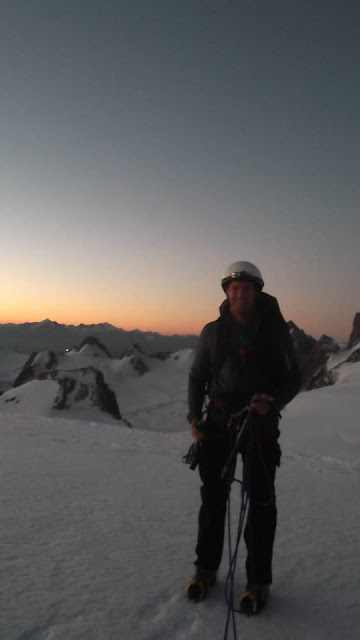 After a lot of watching of the weather and mountain hut availability – we have decided our best bet for a successful summit of, and flight from, Mont Blanc will be early morning on Saturday 14th. We’ll climb up to the Gouter hut (crossing the notorious Grand Couloir) on Friday and then set off around 2am on Saturday morning. Winds at 5000m are still forecasted to be around 50km/h – but hopefully by dropping down a couple of hundred meters we can find a safe launch site. Very, very exciting. Bring it on! Sponsorship continues to fly in and we are really grateful for all of your support - if you haven't donated yet, please click on the big picture above! Monday was spent mountaineering – getting used to climbing at altitude, practicing ice climbing and learning safety techniques for crevasse crossings. This was Jam’s first time walking down the knife edge arête from the Midi station at 3,600m – and he headed down roped to Irwyn, whilst I was tied in a three with Jenni and Graham. We had a good couple of hours trekking around the Valle Blanche glacier – the weather cleared beautifully and we had a quick snack on the ice ledge that I’d flown off a week earlier. The weather started to change though – and as we headed back up the arête the clouds came in and the wind started to whip across the ridge. We kept the pace up and tried to ignore the ridiculous slopes either side and I particularly enjoyed Jam’s face as he emerged from the mist – he was waving at me, but he was wearing mittens and it may well have been with only one finger. Tuesday arrived and the summit date is getting closer – so we were up bright and early for an early morning fitness session. We go on the first lift up to 3,800m – way above the clouds – and did sprints, stairs, burpees, star jumps and some serious flipcup to get the heart pumping and lungs working on the thinner air. We then drove to Annecy to do some ground handling and drills to familiarize ourselves with our new wings. Today we confirmed sponsorship from ITV paragliding – a company steeped in paragliding fame. After creating one of the first specific paragliding wings, ITV have always been involved in the evolution of the sport, peppering its history with famous names and innovations: multicells, eliptical geometry, line technologies, V-ribs, diagonal reinforcements (most of which means nothing to us – but it sure sounds good!). The wings we will be using are the Awak 2s – a really lightweight tandem wing that are easier to inflate and importantly at less than 7kg will reduce the amount of kgs we have to lug up to the mountain. We’ll weigh the total kit with harnesses and ropes before we leave so we can figure out the total loads we’ll be carrying. We spent the rest of the afternoon playing in Lake Annecy – beautiful scenery, crystal clear waters and more importantly rope swings and trees to jump off. Flights and more training tomorrow - and a final kit check before pulling together our summit gear. Beer with breakfast, not the start I was expecting (wanted), but Sam’s achievement of taking his first tandem flight from an icy ledge @ 3800m was worth toasting… The agenda after that was to start my acclimatization, which simply involved taking the lifts up to where Sam had just flown down from, walk the stairs and get sun burnt (not sure the latter was required, but we did it anyway). It’s amazing how just a few steps at that altitude can get you out of breath and make you feel dizzy – everyone had told us the importance of acclimatizing and my first experience up at 3800m really proved that point. Over the coming days waiting for a weather window – we aim to spend as much time at altitude as possible, taking it easy, reading books and perfecting our flip cup skills. On Thursday the weather was good to fly so we took this opportunity to become familiar with the kit we’ll be carrying up and flying down in. 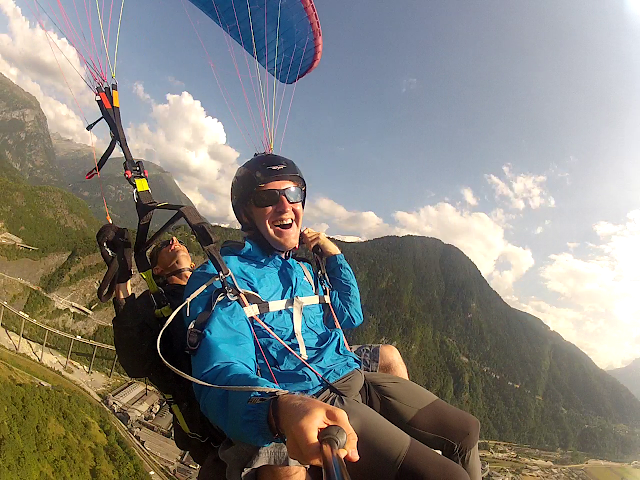 Irwyn and Graham were fantastic; they found a gradual slope strapped us to the paraglider (“wing”) and told us to run. To be more specific; the task was to try and run with the wing correctly inflated and in control whilst keeping enough forward momentum for a quick and safe take off. Sam went first and I videoed (laughed); the learning curve was steep but after a few attempts the battle of wing vs sam started to shift in his favor. I followed and wasn’t much better. The next exercise was to strap Sam and I together on the wing, one playing the role of the pilot and the other the passenger. The reason being that a quick and safe take off is a team effort; the pilot controls the wing and the passenger drives everything forward to the point of take-off. Irwyn and Graham wanted us to experience this from both sides, making us all the more prepared for the challenge ahead. However, two people although being heavier, produced a lot more power and meant that the wing quickly was over our heads and in a position where we could fly. On Friday the plan was to walk down from the Aigle Du Midi towards the cosmiques hut so that we could gain some experience walking with crampons, ropes and using ice axes. Sadly, the bad weather that had been forecast for Fri evening beat us to the top, making the conditions unfavorable for what we intended to do. As we are quickly realizing, plans are important in the mountains but they are entirely weather dependent and we always have to be prepared to react to changing conditions. With this knowledge, we descended down to the middle station (~2500m) where conditions were perfect for a 5km alpine walk over to the mer de glace glacier. Here we were able to put on our crampons and got to walk on some steep ice! To keep things interesting, Irwyn demonstrated some of the skills used for steeper and more technical ice climbing. On Saturday the weather above 3000m wasn’t favorable meaning it would be another day at low levels trying to keep our fitness up. Our advice; walk up to the middle station from the valley bottom (~1000m vertical climb). This was the perfect opportunity to use my new Rab 100% morino wool base layer. The guy in the shop told me I could sweat into this 4 times before it needed washing. When we got down, it needed washing. But my absolute highlight of the day was Sam getting a phone call from Rich Webster to say that he’d missed his 2pm flight out to come and see us due to a big Friday night…. He booked on the first flight from Gatwick for Sunday morning. Sunday started with a 7.30 phone call from Rich, he’d missed his flight again due to a messy Saturday night… But the old rule stands, 3rd time a charm and he made it in to Geneva for 2pm. As this was our rest day we took the chance to go down to Lake Geneva where we had lunch in a beautiful medieval village called Yvoire and then headed to a pier to perfect our acrobatic diving and backflips - whilst also getting in a solid Waboba session. After bidding farewell to Albert – who headed back to Nice early on Monday – I met up with Irwyn whom we had done some training with back in April – and discussed training plans, weather forecasts and dates for summit attempt. The weather was looking great for the first few days, but pretty shocking for the end part of the trip – when the summit is scheduled. Fingers crossed conditions improve. Training and acclimatization was to start straight away – and we headed up to the Aguille de Midi lift station – a cable car up to 3,800m – allowing anyone to access the amazing views of the mountains and being a great acclimatization aid. Once at altitude and after taking in the amazing views – we had a sandwich and then ran up and down as many stairs as we could find – being this high meant I got out of breath very quickly and even felt a bit dizzy – but the more I can do this the better prepared I will be for reaching the high summits. We agreed that I’d take a rest day to give my legs a break post cycling and I wandered around town a bit to get my bearings before heading back to the apartment for a great curry cooked by Jenni, and met Dan and Shane – other paragliders who were hoping to fly off the top of Mt Blanc this summer. They’d be in the Alps for over a month and had already summited Mt Blanc. Looking at the mountain forecast – weather looked perfect for a summit attempt and so Dan and Shane were planning an ascent. We decided we’d join them for the trip to the Cosmiques mountain hut – from which they would start their final ascent at 2am and we would try to fly from an ice shelf off near the Aiguille de Midi. So much for my rest day! I was pretty terrified. My first experience with crampons would be walking down a knife edge arête with huge slopes either side. I was roped to Jenni and Graham and we took it nice and slowly – and I soon relaxed. It was about a 45 minute hike to the mountain hut and I enjoyed every moment. 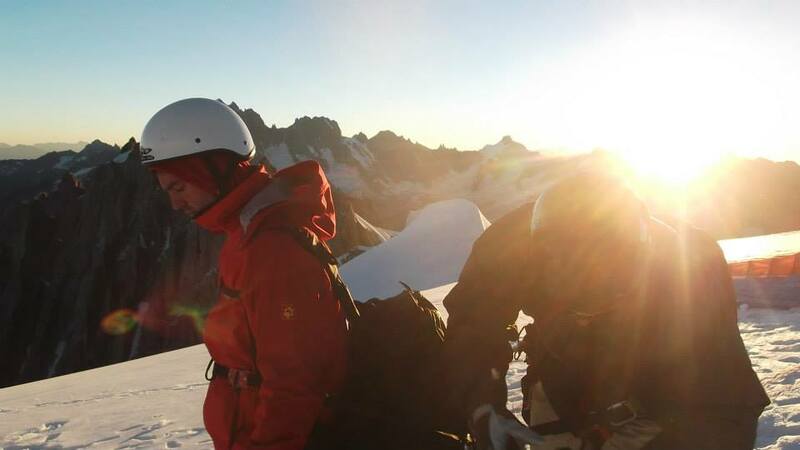 A good hearty meal in the hut, a beautiful sunset, a terrible nights sleep – and we were up at 4:30am ready to go. The hike up to the take off point was along a similar route as we had taken the previous day, so navigation in the dark wasn’t too much trouble, and we found ourselves on the ice shelf above Chamonix just as the sun was rising. Incredible. Now for the flight! When flying a tandem – my job is to be the engine – run with as much power as possible to pull the wing up into the air and give us enough speed to take off – before we plummet off the edge of the cliff. First take off was a failure. Running at full pelt but in deep snow and we couldn’t get enough speed up, and so I heard ‘abort, abort’ shouted from behind me as we approached the cliff edge. Pretty terrifying so I hit the deck straight away. Second time around - we nailed it. 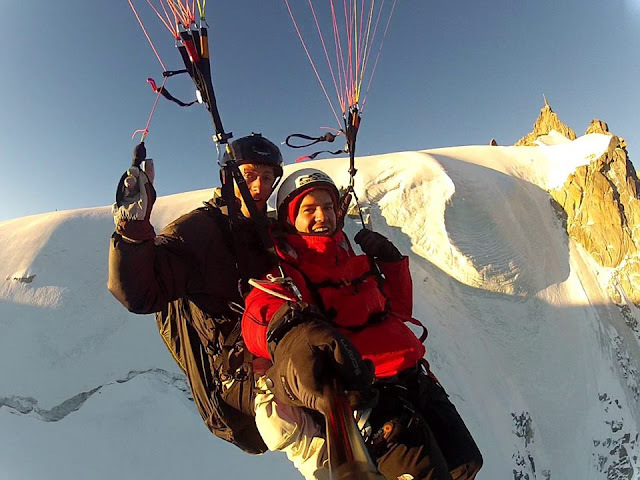 Full speed off the cliff – and before I knew it we were soaring up over Chamonix. Amazing feeling. I took controls for a little while and then we had a bit of fun pulling huge spins and descending as fast as possible – felt some serious G and a massive adrenalin rush. We landed around 7:30am, with Jenni following us down, and I headed back to the apartment to meet Jam and have a celebratory beer. A great first couple of days in the mountains! Thanks a lot for visiting this blog - and hopefully - for sponsoring us on this challenge! After over a year of planning and training, I'll be setting off on my bike (with a few friends) from Vauxhall Bridge on the 25th of August - and cycling through France with Albert, hoping to arrive in Chamonix 8 days later. 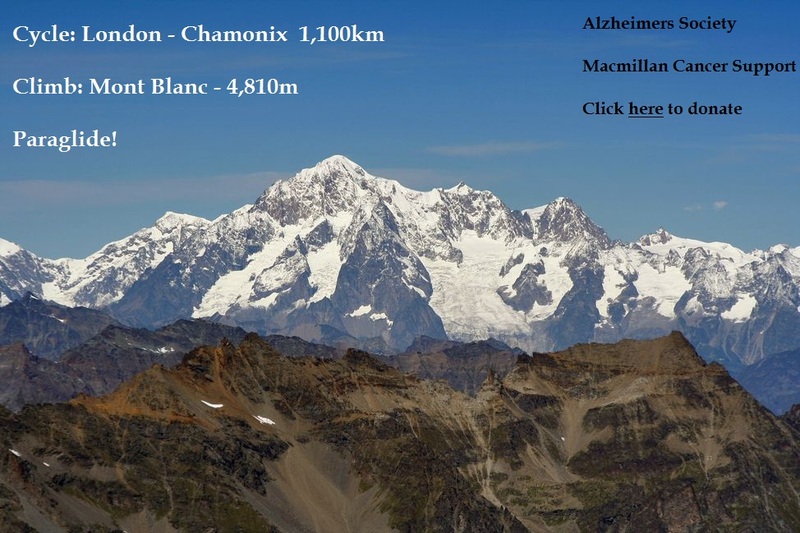 Here I'll meet up with Jam Jones - and after some acclimatization, technical training, practice flights and some smaller summits, we'll climb Mt Blanc with our (horribly heavy) paragliding equipment and fly off. As we fly down we'll have the choice to land in Italy, France or Switzerland - and we'll bring some ice down from the summit to have in our celebratory whiskeys.